Judy and Dave have long cared for marginalized people. A year ago Judy was told she had cancer. She passed away on Dec. 9, 2017. After 19 years of experience founding and growing Alto Refugio, High Refuge, a non-government HIV ministry in Asunción, Paraguay’s capitol, David and Judy moved to Ciudad del Esté (CDE), the country’s second largest city, in February 2016 to pioneer an AIDSLink ministry in partnership with OM. 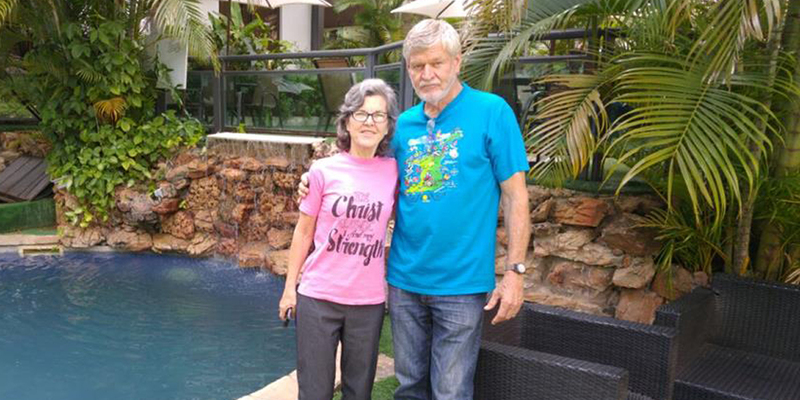 Judy and David sprang into ministry in CDE, visiting a local hospital’s HIV department, establishing a support group in their home for those living with HIV or AIDS and giving Bible-based HIV awareness presentations in local schools, churches and universities. David discovered open doors at the hospital. “Every time the [HIV] programme would open, he was there. They gave him full liberty to connect with all of their registered HIV patients,” Judy said. Patients also found refuge at the Conexión Vida, Life Link, drop-in centre, where the Schmidts had upstairs living quarters. The weekly support group meetings were especially appreciated by those living with HIV, who could connect with others dealing with the same diagnosis. “We tried to accommodate their immediate needs as much as possible, which might include a nutritious meal or a bed right there for someone needing to rest, even during the support-group meeting,” Judy described. Within ten months of moving to CDE, the couple had connected with 200-plus patients—each one registered in the couple’s phones—and saw “work opportunities without end” in their new community. Around the same time the Schmidts arrived in CDE, however, Judy began experiencing pain and discomfort in her stomach. “I didn’t have a clue what was going on. I just thought it was gastritis [from] the stress of moving,” she admitted. She was hospitalised several times for infections, but the different medications doctors gave her didn’t mprove her condition. Eventually, her son, also a doctor, suggested an MRI. Judy pursued treatment, by that time realising something more serious was affecting her abdomen. On Nov. 9, 2016, Judy received news that she had cancer. Four days later, she had a large birthday celebration and worship time in Asunción, where she shared her testimony with the group. “While I was doing all that, explaining why we were praising and where I was at, I didn’t know what kind of cancer [I had] or what was really going on,” she said. After the party, with only family present, Judy learnt she had a very rare and aggressive cancer. During the following months of chemotherapy and other treatment, she received a picture from God. Upon learning about her cancer, Judy didn’t cry over her diagnosis—not for herself, her husband or her family. But when she and David had to close down the emerging AIDSLink ministry in CDE, she wept. Judy knew her deteriorating health would prevent her from walking up stairs to their apartment in CDE, and she needed to be closer to doctors’ help. David finished the presentations for the school year, and then the couple moved out of their inner-city apartment, back to their rural Lucero property. “How could it be?” Judy wondered. “If the Lord had called us, and we were so sure, and we were off to such a good start and then worked so hard and had so many contacts already and so many friendships? Many of the HIV patients come from nominal Catholic backgrounds, but aside from births, weddings and deaths, few practice their faith. “There may be [evangelical] churches in that area, but the churches are not reaching out to this particular group of people that have HIV,” explained Paraguay’s field leader Eddy Froese. Pray for David and Judy Schmidt as they walk through Judy’s cancer. Pray that God would surround them, comfort them and heal Judy. Dave and Judy Schmidt have served for many years as EMC Missions workers in Paraguay. They have also served as a pastoral couple to the Roseisle EMC in western Man. They serve with OM, which prepared this article in August.